Cyclists rejoice! ﻿The time of the electric bike has come! 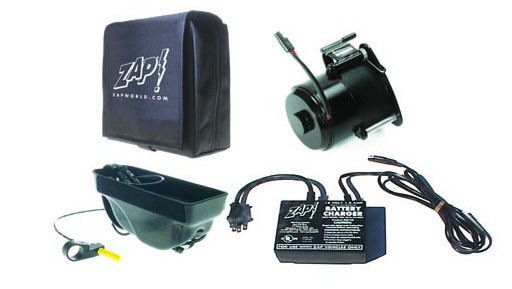 ZAP has over fourteen years of experience electrifying existing bicycles into electric power assist vehicles, and through the years has perfected the process, providing the end user a smooth, yet exhilarating ride. 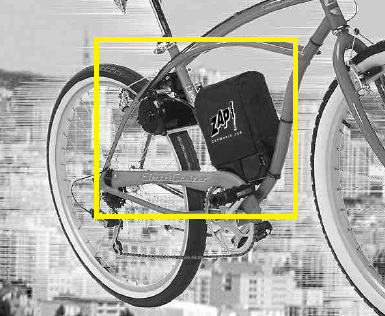 By giving cyclist a boost of electric power, ZAP SX electric bike kits provide cyclists with increased hill climbing capacity, and the ability to travel speeds of up to fourteen miles per hour for fifteen miles without needing to pedal once (Range and Top Speed vary in accordance with factors such as pedaling, terrain, user weight and riding experience). Weight: Battery weight: 13 lbs. Motor: 5 lbs. Charger: 3 lbs. Motor: Single, high efficiency, ceramic, permanent magnet direct current motor. Motor has a 290 watt (1/3 horsepower) output. Without a load, rotation is approximately 4,000 rpm, sealed and capable of operating under water. The rated power is chosen as the power output at the shaft at the most commonly operated RPM (3000 rpm). The peak rating is the greatest power the motor is capable of putting out, which is 290 Watts (746 watts = 1 horsepower). Average people expend 100-150 watts of energy riding a bike, which is sustainable for an hour or so; 300 watts for minutes at a time. Pedaling alone at about 12-13 mph uses as much power as walking a 15-minute mile - about 1/4 hp. That is typical of the average recreational cyclist. Drive Roller: Unique torque sensing mount adjusts automatically for maximum traction and efficiency. The roller, made of a ceramic composite for long life and superior gripping, works well even when wet. Controls: One speed, solid state/electro-mechanical system. Spring loaded safety on/off trigger switch shuts off motor when released. Battery: Sealed, maintenance-free, lead-acid twelve volt, 18 amp-hour battery is approximately 7" x 7" x 3" and weighs about 12.5 pounds. Not a motorcycle battery, but rather a deep cycle battery used for computer Uninterruptable Power Supplies (UPS) and medical technology (X-ray machines). Battery type is starved electrolytes dry cell. Maintenance Free, Lead-Calcium Grid, Usable and rechargeable in any position. High discharge rate capacity. Deep discharge recovery. No memory effect. Battery Containment: Battery bag is a heavy-duty nylon corduroy material with wide Velcro-lines flaps that hold the battery to the battery tray; a 1-inch polypropylene strap completes the connection. When the flaps are open, polypropylene handles allow for quick and easy removal and carrying. Speeds: Non-pedal speed on level, smooth roads is approximately 14 mph (180-pound rider). If you pedal, you can go faster. Lighter riders may go faster; heavier may go slower. Range: Total range is dependent on terrain and rider input through pedaling. The standard battery is good for up to one hour of riding (typically 10-15 miles). Charger: Automatic, portable, 1.5 amp charger plugs into standard electrical socket (110 VAC). Charge in ten hours or less. The charger's 4-foot cord plugs into the ZAP battery using a quick-connector (Motorola-type). Recharge the battery promptly after each ride. The charger will not overcharge no matter how long it is plugged-in. Charging generally takes less than ten hours (maximum = 13 hours). Cost is about 3 cents per charge. Warranty: 30 days, limited warranty. 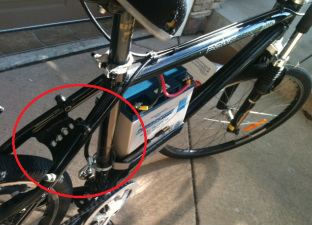 COMPARE THE ABOVE PICTURE (MOUNTING BRIDGE) WITH YOUR BICYCLE, YOU MUST HAVE SAME BRIDGE! It takes around 15 to 30 minutes to install, but remember to READ THE MANUAL FIRST! Kit will work upon you reach 4 miles per hour! Motors: Single, high efficiency, ceramic, permanent magnet direct current motor, high output, with a 3500 rpm peak. Important to check if you have this frame in your bike!